A rendering of AVA Little Tokyo, now under construction at Los Angeles and Second streets. 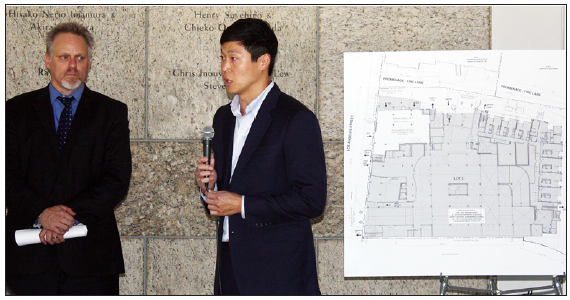 The Little Tokyo Community Council board voted on Sept. 24 to support application by AvalonBay Communities Inc. to the city for a Master Alcohol Conditional Use Permit (CUP) for the apartment complex dubbed AVA Little Tokyo. AVA Little Tokyo, located at the intersection of Los Angeles and Second streets, is a mixed-use project consisting of 280 apartment units and 17,000 sq. ft of retail space. Built on the parking lot known as Block 8, the apartments are part of a multiphase development that will face the Little Tokyo Public Library and the future Budokan of Los Angeles. Chris Murray, representing AvalonBay, said that the CUP will be important as the developers start to show the site to potential tenants, including restaurants and potentially a small supermarket. A hearing on the CUP will take place on Oct. 15 before the Department of City Planning. The motion comes with stipulations, including that Avalon Bay report regularly to the LTCC and honor all prior conditions agreed to by the previous developer, Related Companies, with the city and Little Tokyo stakeholders. “We would like to see you guys not just when you want something but be active participants in the Little Tokyo community,” said Evelyn Yoshimura, chair of the Preservation and Cultural Planning Committee. Murray said that AvalonBay had heard the community’s concerns. “You’re absolutely right, we’re looking at ways of integrating ourselves into your community. We got the message loud and clear,” Murray said. The first phase of AVA Little Tokyo is scheduled to be completed late 2014. There will be 55 parking spaces available to the public. Also under construction in the same block is the Sares Regis Group development, a 240 mixed-use apartment complex on San Pedro and Second streets. The apartment community will include townhomes, retail space and three levels of underground parking with 130 spaces set aside for public parking.